Rowling's Harvard Speech Doesn't Entrance All J.K. Rowling gave the commencement address at Harvard on Thursday. While some graduates were giddy to hear from the Harry Potter author, others grumbled. They noted that Harvard is known for inviting heavy hitters, like Bill Gates, to address students. Author J.K. Rowling walks in procession at Harvard University commencement ceremonies. The author said she was nervous about speaking to the graduates. Read J.K. Rowling's commencement speech. If her books' sales are any indicator, there are probably hundreds of millions of Harry Potter fans round the world who'd give anything for a chance to hear from the books' author, J.K. Rowling. 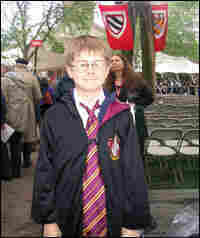 And hundreds of them turned out at Harvard University's commencement Thursday, where Rowling was the featured speaker. But there was also a group of graduating seniors at Harvard grousing that Rowling wasn't worthy of the honor. A reluctant public speaker, Rowling began her address alluding to the enormousness of her task. "The first thing I'd like to say is thank you," she said. "Not only has Harvard given me an extraordinary honor. But the weeks of fear and nausea I've experienced at the thought of giving this commencement address have made me lose weight!" With humor, and poise, Rowling went on to speak of the challenges she has overcome on the way to her success, and she extolled the power of imagination to help right wrongs around the world. "Unlike any other creature on this planet, humans can learn and understand without having experienced," said Rowling. "They can imagine themselves in other peoples' places. "We do not need magic to transform the world. We carry all the power we need inside ourselves already. We have power to imagine better." Her fans were giddy with delight. "She's a rock star!" exclaimed senior Ross Lipsteen, who like many in his class has read all seven Harry Potter books. Senior Kevin Ferguson found Rowling "inspirational." "She touched me definitely, without a doubt," says Ferguson. "I was crying a little bit. I tried to fight it but J.K. just brought it out." But to other seniors, the guest of honor was less than magical. "You know, we're Harvard. We're like the most prominent national institution. And I think we should be entitled to ... we should be able to get anyone. And in my opinion, we're settling here. " Rowling was chosen by Harvard's alumni. University President Drew Gilpin Faust applauded her selection, saying, "No one in our time has done more to inspire young people to ... read." Rowling follows a long line of heavies who've spoken at Harvard's commencement. In 1947, Secretary of State George C. Marshall used the platform to detail his "Marshall Plan" to rebuild Europe after World War II. Since then, speakers have included such luminaries as Microsoft founder Bill Gates, U.N. Secretary-General Kofi Annan, other heads of state, Nobel Prize winners, and scholars. But the grousing didn't sit well with the Harry Potter fans. "That was a terrible thing to say! They're just a bunch of Muggles!" exclaimed 10-year-old Allister Beeson, borrowing a Hogwart term for ordinary folks who don't benefit from the gift of magic. Beeson was one of many young people in the audience who skipped school to hear Rowling. He came in a Harry Potter Halloween costume, all the way from New York. He says Harvard seniors who have a problem with Rowling are actually the ones with the problem. He says they simply lack common sense. "Phooey on them for saying she's not important. They just don't get it." Older Harry Potter fans were similarly dismissive of the grumbling. To many, the complaints just prove that even Harvard graduates still have a lot to learn. "They'll grow up," says 1983 graduate David Epstein. "They'll have a broader worldview and they'll understand that there are many, many ways to contribute. You know what they say — the freshman bring so much, and the seniors take away so little."